Remember when you were a kid and begged your parents for a quarter to put into the gumball machine at the grocery store? That feeling of success when you won and started chomping down on that gumball victoriously? After five chews, it loses its taste, goes hard and you ditch it more quickly than the need for it came on. What’s the draw of the gumball? Instant Gratification. A reward you can see right now for an action you take. Waiving the magic wand and giving me exactly what I want right now. In theory, instant gratification is exciting, but the desire for it in marketing is one of the biggest mistakes business owners can make. Instead of spreading your money around town at every gumball (or marketing opportunity) that calls your name, invest in a solution that will have a long term impact on your business. One that not only helps build growth without wearing out, but also one that can help you sustain that growth over the horizon. 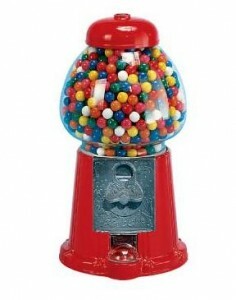 So next time you’re tempted to feed that gum ball machine or jump on some low priced, “instant results” marketing campaign, remember that shiny new things wear out quickly. Instead spend your marketing dollars in something that will help growth your business in the long term with a planned out strategy.